PlayMakers: First Man in Metamorphoses, Assassins, A Raisin in the Sun, Clybourne Park, Imaginary Invalid, Henry IV & V, The Parchman Hour, 8 (Staged Reading). International: Performer/Co-Facilitator, Playback Theatre (Playback Berlin/Second International Conference for the Arts in Society, Kassel, Germany). 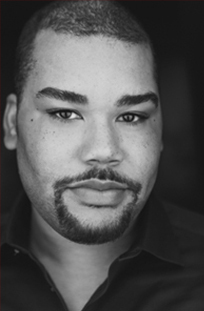 Regional: Roosevelt Hicks in Radio Golf (Deep Dish Theater Company); Triassic Parq (Wagon Wheel Arts); 10×10 in the Triangle (The ArtsCenter); Benjamin Coffin III in Rent; The Two Gentlemen of Verona; Ceremonies in Dark Old Men. University: Lion in The Wiz, A Guest of Honor, The Pirates of Penzance, The Miser, Polaroid Stories (California State University, San Bernardino). Education: MFA candidate in the Professional Actor Training Program, UNC-Chapel Hill; BA in Theatre Arts-Acting/Minor in Film Studies, California State University, San Bernardino.